What Is Powder Coat and Why Is It Better Than Paint? By now you may have heard of the cutting edge technology known as “powder coating.” It’s a new way of applying color that’s vastly superior to good old-fashioned painting. In this post, we’ll take a look at how we apply powder coat to our doors at PCA, how it differs from paint and what makes it so much better. PCA starts with a fully assembled screen doorframe so that all screws and seams get a uniform coat, we first clean all surfaces to get rid of grease, dirt or anything else that might interfere with the process. Once cleaned and rinsed, the door is dipped in an etching solution so that the powder will completely bond with the frame during the curing stage. This serves the same function as applying a coat of primer before painting, but it’s a lot more difficult and requires some special equipment. Once the frame is completely dry, it’s almost ready for the powder. Except there isn’t yet anyway to make it stick to the frame. 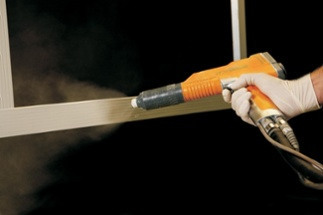 To solve this challenge, the powder is applied to the frame with a special spray gun – it gives each individual particle a negative electrical charge. At the same time, the frame is electrically grounded, so that it electrostatically attracts and attaches the negatively charged powder. Finally, the coated frame is cured in a special oven at a temperature of 395°F. There, the powder gels, flows and bonds to produce a smooth, durable layer. It’s at this point that the frame can be removed from the oven, cooled in ambient air, and its screen attached. Besides making the powder stick, electrostatic attraction also guarantees that the distribution of powder is completely uniform, providing a much smoother and more even finish than is possible with paint. Powder coat is much harder than paint, meaning significantly greater scratch and chip resistance, and generally better durability. Powder coated doors are rust-free, and have been tested to exceed 4,000 hours of salt spray exposure. Moreover, a scratch in screen door paint will decay or rust, lift the surrounding paint, and spread over time. But, if somehow you do manage to scratch powder coat, unlike a painted screen door, it’s so well bonded to the frame that the scratch will never expand. And a powder coated door doesn’t need repainting – ever. Because of the pretreatment process and the intense heat of curing, powder coat sticks to a screen door frame much better than paint possibly can, helping to make it extraordinarily resistant to chipping. Unlike paint, powder coat won’t crack if the metal it covers flexes a little. Published flexibility tests demonstrate that powder coat can stretch 100-800 percent before cracking or flaking occurs. Powder coat can be put on 4 to 10 times thicker than paint; this extra thickness helps protect the metal underneath from corrosion. Additionally, powder coat is free from the porosity caused by evaporation when paint dries, further protecting the screen door underneath from corrosive elements. Powder coating ensures that you have the most durable finish because natural wood and vinyl can’t be powder coated. For instance, vinyl can’t withstand the extreme curing temperatures necessary for bonding. So neither a wood screen door nor a vinyl screen door is suitable for powder coating. Can aluminum be powder coated? Thankfully, aluminum is ideally suited to the process. And this means that, out of all of the different possible screen door materials, a powder coated screen door has to be a durable screen door made of aluminum, the strongest and most long-lasting material available. So now you can see why at PCA, all of our screen doors are powder coated aluminum. Though the process is by no means easy, it’s by far the best way to get a beautiful long lasting finish.